Sony’s top-of-the-line gaming console is the PlayStation 3 (or PS3). 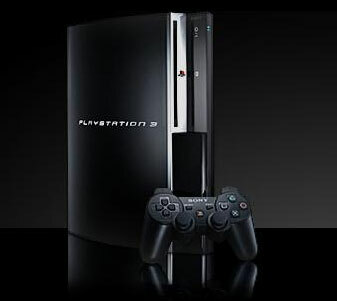 The PlayStation 3 was designed for high-performance gaming in a home theater with an HDTV display. The PS3 is built around an entirely new kind of CPU called the Cell processor, designed by IBM with a little help from Sony and Toshiba. The Cell processor has multiple independent processing sections that give the PS3 the ability to render video at rates previously unheard of for consumer-grade computing devices. Because the PS3 includes a built-in Blu-ray disc player, it can support high-definition optical discs for playing movies, and the capacity of Blu-ray (well over 20GB of data per disc) lets game makers cram a ton of detail into their game software. Just as importantly, the PS3 makes a great choice for your home theater’s Blu-ray disc player. The PS3 supports all the video formats of Blu-ray (including 1080p24) over its HDMI output, and because it’s essentially a computer at heart, is easily upgradeable to support new Blu-ray features such as BonusView and BD-Live. All for a price that’s little more than most single-purpose, Blu-ray disc players on the market. Built-in wireless networking: You can easily connect to Internet online gaming services through your Wi-Fi network, as well as an Ethernet connection for wired networks. A powerful graphics chip: The chip, developed by NVIDIA, processes the gaming graphics and displays them on your screen at the highest possible resolution. Connections galore: Connections include HDMI outputs for connecting to your HD display (component video is also available) and optical and coaxial digital audio outputs for connecting to your A/V receiver for Dolby Digital or DTS 5.1-channel surround sound. Wireless (Bluetooth) controllers for cord-free game play: You can connect up to seven of these wireless controllers (called Sixaxis controllers). They even include a less sophisticated version of the motion control found in the Wii gaming console. A hard disc drive (most versions): Store gaming data as well as your own pictures, music, and video. The PS3 can send this content to your home theater’s display and audio system. Two USB 2.0 (high-speed) ports: Connect peripheral devices such as digital cameras. The PS3 also includes a built-in card reader for Sony’s Memory Stick format as well as the SD and Compact Flash formats used by other camera manufacturers. A Web browser: Surf the Web or check your e-mail, all from the comfort of your sofa!